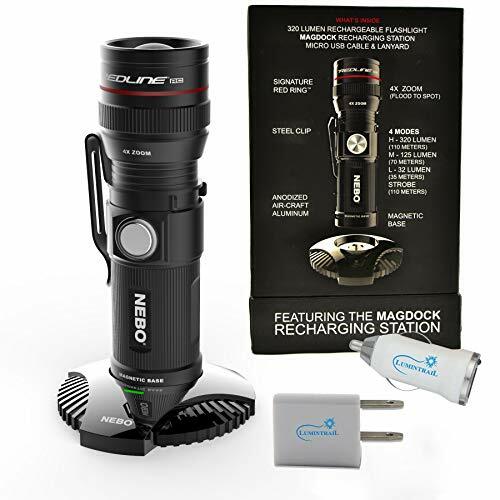 Bundle includes Lumintrail USB car and wall plugs The newest rechargeable REDLINE is the REDLINE RC with MagDock. The MagDock is a magnetic charging station that docks and charges your REDLINE. Small enough to fit in the palm of your hand, the REDLINE RC with MagDock is fully equipped with all of the features that make the REDLINE series so popular. LIGHT High-power 320 lumen LED DESIGN 4x adjustable zoom Anodized aircraft-grade aluminum. water and impact-resistant OC Technology Convex lens Signature Red Ring Steel belt/pocket clip Ergonomic non-slip grip Magnetic base Protective LED housing Charging indicator light OPERATION Side-positioned, ON/OFF button Run times for each mode - High: 1 Hour - Medium: 2 Hours - Low: 9 Hours - Strobe: 2 Hours ACCESSORIES USB to Micro USB cable included Lanyard included BATTERIES Internal, rechargeable lithium-ion battery (Recharge time - up to 2 hours) SPECS Length: 3.5625" (compacted) / 3.875" (extended) Diameter: 1.25" 0.25 lbs.